^ Gilvarry, J. J. (1953). “Relativity Precession of the Asteroid Icarus” (英語) (subscription required). Physical Review 89 (5): 1046. doi:10.1103/PhysRev.89.1046. http://prola.aps.org/abstract/PR/v89/i5/p1046_1 2011年3月19日閲覧。. ^ a b c d Benz, W.; Slattery, W. L.; Cameron, A. G. W. (1988). “Collisional stripping of Mercury's mantle” (英語). Icarus 74 (3): 516–528. doi:10.1016/0019-1035(88)90118-2. ^ Liu, Han-Shou; O'Keefe, John A. (1965). “Theory of Rotation for the Planet Mercury”. Science 150 (3704): 1717. doi:10.1126/science.150.3704.1717. PMID 17768871. ^ a b c d Strom, Robert G.; Sprague, Ann L. (2003). Exploring Mercury: the iron planet. Springer. ISBN 1-85233-731-1. ^ a b Margot, L.J. ; Peale, S. J.; Jurgens, R. F.; Slade, M. A.; Holin, I. V. (2007). “Large Longitude Libration of Mercury Reveals a Molten Core”. Science 316 (5825): 710–714. doi:10.1126/science.1140514. PMID 17478713. http://adsabs.harvard.edu/abs/2007Sci...316..710M. ^ Lyttleton, R. A. (1969). “On the Internal Structures of Mercury and Venus” (英語). Astrophysics and Space Science 5 (1): 18. doi:10.1007/BF00653933. ^ Spohn, Tilman; Sohl, Frank; Wieczerkowski, Karin; Conzelmann, Vera (2001). “The interior structure of Mercury: what we know, what we expect from BepiColombo”. Planetary and Space Science 49 (14–15): 1561–1570. Bibcode: 2001P&SS...49.1561S. doi:10.1016/S0032-0633(01)00093-9. ^ Anderson, J. D.; et al. (July 10, 1996). “Shape and Orientation of Mercury from Radar Ranging Data”. Icarus (Academic press) 124: 690–697. doi:10.1006/icar.1996.0242. ^ a b c d e ニュートン (別2009)、pp. 58–59、水星の巨大な核はどうやってできた? ^ Cameron, A. G. W. (1985). 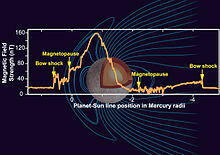 “The partial volatilization of Mercury”. Icarus 64 (2): 285–294. doi:10.1016/0019-1035(85)90091-0. ^ Weidenschilling, S. J. (1987). “Iron/silicate fractionation and the origin of Mercury” (英語). Icarus 35 (1): 99–111. doi:10.1016/0019-1035(78)90064-7. ^ Schenk, P.; Melosh, H. J.; (03/1994). “Lobate Thrust Scarps and the Thickness of Mercury's Lithosphere” (英語). Abstracts of the 25th Lunar and Planetary Science Conference 1994: 1994LPI....25.1203S. http://adsabs.harvard.edu/abs/1994LPI....25.1203S 2011年3月19日閲覧。. ^ a b Dunne, J. A. and Burgess, E. (1978). “Chapter Seven” (英語). The Voyage of Mariner 10 — Mission to Venus and Mercury. NASA History Office. http://history.nasa.gov/SP-424/ch7.htm 2011年3月19日閲覧。. ^ Spudis, P. D. (2001). “The Geological History of Mercury” (英語). Workshop on Mercury: Space Environment, Surface, and Interior, Chicago: 100. http://adsabs.harvard.edu/abs/2001mses.conf..100S 2011年3月19日閲覧。. ^ Strom, Robert (September 1979). “Mercury: a post-Mariner assessment”. Space Science Reviews 24: 3–70. ^ Broadfoot, A. L.; S. Kumar, M. J. S. Belton, and M. B. McElroy (July 12, 1974). “Mercury's Atmosphere from Mariner 10: Preliminary Results”. Science 185 (4146): 166–169. doi:10.1126/science.185.4146.166. PMID 17810510. ^ Head, James W.; Solomon, Sean C. (1981). “Tectonic Evolution of the Terrestrial Planets” (英語). Science 213 (4503): 62–76. doi:10.1126/science.213.4503.62. PMID 17741171. http://www.sciencemag.org/cgi/content/abstract/213/4503/62 2011年3月19日閲覧。. ^ Dzurisin, D. (October 10, 1978). “The tectonic and volcanic history of Mercury as inferred from studies of scarps, ridges, troughs, and other lineaments” (英語). Journal of Geophysical Research 83: 4883–4906. doi:10.1029/JB083iB10p04883. http://adsabs.harvard.edu/abs/1978JGR....83.4883D 2011年3月19日閲覧。. ^ a b Van Hoolst, Tim; Jacobs, Carla (2003). “Mercury's tides and interior structure” (英語). Journal of Geophysical Research 108 (E11): 7. doi:10.1029/2003JE002126. ^ Domingue, Deborah L. et al. (August 2009). “Mercury's Atmosphere: A Surface-Bounded Exosphere”. Space Science Reviews 131 (1–4): 161–186. doi:10.1007/s11214-007-9260-9. http://adsabs.harvard.edu/abs/2007SSRv..131..161D. ^ Hunten, D. M.; Shemansky, D. E.; Morgan, T. H. (1988). “The Mercury atmosphere” (英語). Mercury. University of Arizona Press. ISBN 0-8165-1085-7. http://www.uapress.arizona.edu/onlinebks/Mercury/MercuryCh17.pdf 2011年3月19日閲覧。. ^ Zurbuchen, Thomas H. et al. (July 2008). “MESSENGER Observations of the Composition of Mercury's Ionized Exosphere and Plasma Environment”. Science 321 (5885): 90–92. doi:10.1126/science.1159314. PMID 18599777. ^ Killen, Rosemary; Cremonese, Gabrielle; Lammer, Helmut et al. (2007). “Processes that Promote and Deplete the Exosphere of Mercury”. Space Science Reviews 132: 433–509. doi:10.1007/s11214-007-9232-0. http://adsabs.harvard.edu/abs/2007SSRv..132..433K. ^ McClintock, William E.; Vervack Jr., Ronald J.; Bradley, E. Todd et al. (2009). “MESSENGER Observations of Mercury's Exosphere: Detection of Magnesium and Distribution of Constituents”. Science 324 (5927): 610–613. doi:10.1126/science.1172525. PMID 19407195. http://adsabs.harvard.edu/abs/2009Sci...324..610M. ^ a b c d e Beatty, J. Kelly; Petersen, Carolyn Collins; Chaikin, Andrew (1999). The New Solar System. Cambridge University Press. ISBN 0-521-64587-5. ^ Prockter, Louise (2005) (英語) (PDF). Ice in the Solar System. Volume 26. Johns Hopkins APL Technical Digest. http://www.jhuapl.edu/techdigest/td2602/Prockter.pdf 2011年3月19日閲覧。. ^ Lewis, John S. (2004). Physics and Chemistry of the Solar System (2nd ed.). Academic Press. p. 463. ISBN 0-12-446744-X. ^ Murdock, T. L.; Ney, E. P. (1970). 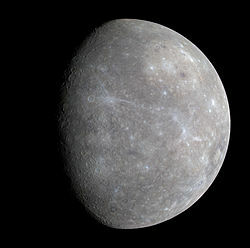 “Mercury: The Dark-Side Temperature” (英語). Science 170 (3957): 535–537. doi:10.1126/science.170.3957.535. PMID 17799708. http://www.sciencemag.org/cgi/content/abstract/170/3957/535 2011年3月19日閲覧。. ^ Lewis, John S. (2004) (英語). Physics and Chemistry of the Solar System. Academic Press. p. 461. ISBN 978-0-12-446744-6. http://books.google.com/?id=ERpMjmR1ErYC&pg=RA1-PA461&lpg=RA1-PA461&dq=solar-constant+mercury+-wikipedia+-wiki+-encyclopedia 2011年3月19日閲覧。. ^ Ingersoll, Andrew P.; Svitek, Tomas; Murray, Bruce C. (November 1992). “Stability of polar frosts in spherical bowl-shaped craters on the moon, Mercury, and Mars”. Icarus 100 (1): 40–47. Bibcode: 1992Icar..100...40I. doi:10.1016/0019-1035(92)90016-Z. ^ Slade, M. A.; Butler, B. J.; Muhleman, D. O. (1992). “Mercury radar imaging — Evidence for polar ice” (英語). Science 258 (5082): 635–640. doi:10.1126/science.258.5082.635. PMID 17748898. ^ a b c Rawlins, K; Moses, J. I.; Zahnle, K.J. (1995). “Exogenic Sources of Water for Mercury's Polar Ice”. Bulletin of the American Astronomical Society 27: 1117. Bibcode: 1995DPS....27.2112R. ^ Harmon, J. K.; Perillat, P. J.; Slade, M. A. (January 2001). “High-Resolution Radar Imaging of Mercury's North Pole”. Icarus 149 (1): 1–15. doi:10.1006/icar.2000.6544. ^ Seeds, Michael A. (2004). Astronomy: The Solar System and Beyond (4th ed.). Brooks Cole. ISBN 0-534-42111-3. ^ Christensen, Ulrich R. (2006). “A deep dynamo generating Mercury's magnetic field”. Nature 444 (7122): 1056–1058. doi:10.1038/nature05342. PMID 17183319. ^ Spohn, T.; Sohl, F.; Wieczerkowski, K.; Conzelmann, V. (2001). “The interior structure of Mercury: what we know, what we expect from BepiColombo”. Planetary and Space Science 49 (14–15): 1561–1570. doi:10.1016/S0032-0633(01)00093-9. ^ Schaefer, Bradley E. (May 2007). “The Latitude and Epoch for the Origin of the Astronomical Lore in Mul.Apin”. American Astronomical Society Meeting 210, #42.05 (American Astronomical Society) 38: 157. http://cdsads.u-strasbg.fr/abs/2007AAS...210.4205S. ^ H.G. Liddell and R. Scott; rev. H.S. Jones and R. McKenzie (1996). Greek–English Lexicon, with a Revised Supplement (9th ed.). Oxford: Clarendon Press. pp. 690 and 1646. ISBN 0-19-864226-1. ^ a b Dunne, J. A. and Burgess, E. (1978). “Chapter One”. The Voyage of Mariner 10 — Mission to Venus and Mercury. NASA History Office. http://history.nasa.gov/SP-424/ch1.htm. ^ Duncan, John Charles (1946). Astronomy: A Textbook. Harper & Brothers. p. 125. "The symbol for Mercury represents the Caduceus, a wand with two serpents twined around it, which was carried by the messenger of the gods." ^ Antoniadi, Eugène Michel; Translated from French by Moore, Patrick (1974). The Planet Mercury. Shaldon, Devon: Keith Reid Ltd. pp. 9–11. ISBN 0-904094-02-2. ^ Kelley, David H.; Milone, E. F.; Aveni, Anthony F. (2004). Exploring Ancient Skies: An Encyclopedic Survey of Archaeoastronomy. Birkhäuser. ISBN 0-387-95310-8. ^ Samsó, Julio; Mielgo, Honorino (1994). 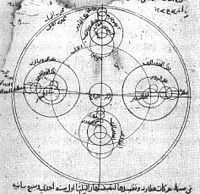 “Ibn al-Zarqālluh on Mercury”. Journal for the History of Astronomy 25: 289–96 . http://articles.adsabs.harvard.edu/full/1994JHA....25..289S. ^ Hartner, Willy (1955). “The Mercury Horoscope of Marcantonio Michiel of Venice”. Vistas in Astronomy 1: 118-122. ^ Goldstein, Bernard R. (December 1969). “Some Medieval Reports of Venus and Mercury Transits”. Centaurus 14 (1): 49–59. Bibcode: 1969Cent...14...49G. doi:10.1111/j.1600-0498.1969.tb00135.x. ^ Ramasubramanian, K.; Srinivas, M. S.; Sriram, M. S. (1994). “Modification of the Earlier Indian Planetary Theory by the Kerala Astronomers (c. 1500 AD) and the Implied Heliocentric Picture of Planetary Motion” (英語). Current Science 66: 784–790. http://www.physics.iitm.ac.in/~labs/amp/kerala-astronomy.pdf 2011年3月19日閲覧。. ^ Sinnott, RW; Meeus, J (1986). “John Bevis and a Rare Occultation” (英語). Sky and Telescope 72: 220. http://adsabs.harvard.edu/abs/1986S&T....72..220S 2011年3月19日閲覧。. ^ Baumgardner, Jeffrey; Mendillo, Michael; Wilson, Jody K. (2000). “A Digital High-Definition Imaging System for Spectral Studies of Extended Planetary Atmospheres. I. Initial Results in White Light Showing Features on the Hemisphere of Mercury Unimaged by Mariner 10”. The Astronomical Journal 119: 2458–2464. doi:10.1086/301323. ^ a b Colombo, G.; Shapiro, I. I. (11/1965). “The Rotation of the Planet Mercury” (英語). SAO Special Report #188R 188. http://adsabs.harvard.edu/abs/1965SAOSR.188.....C 2011年3月19日閲覧。. ^ Holden, E. S. (1890). “Announcement of the Discovery of the Rotation Period of Mercury [by Professor Schiaparelli”] (英語). Publications of the Astronomical Society of the Pacific 2 (7): 79. doi:10.1086/120099. http://adsabs.harvard.edu/abs/1890PASP....2...79H 2011年3月19日閲覧。. ^ Merton E. Davies, et al. (1978). “Surface Mapping” (英語). Atlas of Mercury. NASA Office of Space Sciences. http://history.nasa.gov/SP-423/surface.htm 2011年3月19日閲覧。. ^ Evans, J. V.; Brockelman, R. A.; Henry, J. C.; Hyde, G. M.; Kraft, L. G.; Reid, W. A.; Smith, W. W. (1965). “Radio Echo Observations of Venus and Mercury at 23 cm Wavelength” (英語). Astronomical Journal 70: 487–500. doi:10.1086/109772. http://articles.adsabs.harvard.edu/abs/1965AJ.....70..486E/0000487.000.html 2011年3月19日閲覧。. ^ Moore, Patrick (2000). The Data Book of Astronomy. New York: CRC Press. p. 483. ISBN 0-7503-0620-3. http://books.google.com/books?lr=&as_brr=3&q=kotelnikov+1962+mercury&btnG=Search+Books. ^ Butrica, Andrew J. (1996). “Chapter 5”. To See the Unseen: A History of Planetary Radar Astronomy. NASA History Office, Washington D.C.. ISBN 0-16-048578-9. http://history.nasa.gov/SP-4218/ch5.htm. ^ Pettengill, G. H.; Dyce, R. B. (1965). “A Radar Determination of the Rotation of the Planet Mercury”. Nature 206 (1240): 451–2. doi:10.1038/2061240a0. ^ Colombo, G. (1965). “Rotational Period of the Planet Mercury” (英語). Nature 208: 575. doi:10.1038/208575a0. http://adsabs.harvard.edu/abs/1965Natur.208..575C 2011年3月19日閲覧。. ^ Dantowitz, R. F.; Teare, S. W.; Kozubal, M. J. (2000). “Ground-based High-Resolution Imaging of Mercury”. Astronomical Journal 119: 2455–2457. doi:10.1016/j.asr.2005.05.071. http://ukads.nottingham.ac.uk/cgi-bin/nph-bib_query?bibcode=2000AJ....119.2455D&db_key=AST. ^ L. V. Ksanfomality (2006). “Earth-based optical imaging of Mercury”. Advances in Space Research 38: 594. doi:10.1016/j.asr.2005.05.071. http://adsabs.harvard.edu/cgi-bin/nph-bib_query?bibcode=2006AdSpR..38..594K&db_key=AST&data_type=HTML&format=&high=461152a03222956. ^ Harmon, J. K. et al. (2007). “Mercury: Radar images of the equatorial and midlatitude zones”. Icarus 187: 374. doi:10.1016/j.icarus.2006.09.026. http://adsabs.harvard.edu/abs/2007Icar..187..374H. ^ a b Dunne, J. A. and Burgess, E. (1978). “Chapter Four” (英語). The Voyage of Mariner 10 — Mission to Venus and Mercury. NASA History Office. http://history.nasa.gov/SP-424/ch4.htm 2011年3月19日閲覧。. ^ Mercury NASA Jet Propulsion Laboratory. May 5, 2008. Retrieved 2008-05-29.